We are a kayak and canoe club whose main purpose is to unite persons interested in paddling the Potomac River basin and adjacent watersheds. Competition and cruising have gone hand-in-hand since the formation of CCA. The club’s founding members brought together a small band of paddlers who savored the fellowship of a dancing campfire within the wooded stillness of a remote river island, and who also wanted to provide a sponsoring organization for the annual Potomac whitewater race which began in 1954. Throughout the intervening years, a healthy balance of cruises and races within our program has been of benefit to every active paddler in the club. Improved equipment designs and more highly skilled paddlers have resulted from this competition. CCA sponsors the annual Potomac Downriver Race, usually held in May. For a complete local, national, and international listing of whitewater races, contact the Potomac Whitewater Racing Center or http://www.whitewaterslalom.us/schedules.html. At international competitions, notably the Olympics, World Championships, and World Cup events each year, athletes from the CCA and the Potomac Whitewater Racing Center regularly form two-thirds of the US whitewater slalom team and are well represented on the US wildwater team. 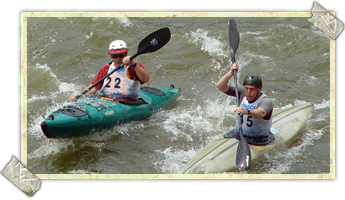 Potomac Whitewater Racing Center (PWRC), formally called the Bethesda Center of Excellence (BCE), began as the racing division of CCA (originally referred to as the Slalom Division in the CCA by-laws). However, as the BCE grew throughout the years, it became its own organization. Years later, BCE chose to rename itself the PWRC. Nonetheless, the PWRC continues to co-sponsor the CCA's Potomac Downriver Race, and the PWRC often works together with the CCA for local training and competition. Greater Washington area athletes have been making the US Whitewater Teams since the 1960’s, and the PWRC is designated as a Center of Excellence training center by the US Olympic Committee and the Whitewater Slalom Committee of USA Canoe/Kayak (USACK). The PWRC relies on the financial support of interested individuals and receives partial funding through the USACK Development Committee. The mission of the PWRC is to provide high-quality, year-round whitewater training sites, world-class training facilities, coaching, training camps, and other training and racing opportunities to all actively training and racing slalom and wildwater athletes. Today many PWRC athletes of all ages train on the Potomac River and compete in the national championships and US team trials. The PWRC’s world-class whitewater athletes are world champions, Olympic medalists, and world cup medalists. The Feeder Cup is a series of four races held on the Potomac River in the summer at near lock 6 of the C&O Canal. Check the schedule for dates. All recreational boaters are encouraged to participate. A & B nationally ranked athletes are encouraged to race, but are not eligible for Feeder Cup points. Points are awarded at each race for participation, clean runs, race placing for first through third, and most improved paddler during the overall race series.